The Milwaukee County Zoo’s family continues to expand with the birth of three female Nigerian dwarf goats at the Northwestern Mutual Family Farm! Born about the same time as the royal wedding between Meghan Markle and Prince Harry, each goat received a name fit for royalty! The eldest, Duchess, was born to Gretel on May 19. Duchess was named in honor of the royal wedding. The younger two were born June 10 to Tinkerbell: Princess Fiona was named after the ogre princess from Shrek, and Beatrice was named after Princess Beatrice of York, a member of the British royal family. The kids (the term used for baby goats) weigh between 8-10 pounds. Full grown, female Nigerian dwarf goats can weigh between 25 and 35 pounds. Previously thought to be pygmy goats, Nigerian dwarf goats originate from West Africa, but are now domesticated all over the world. The earliest documentation of these goats being brought to the U.S. was in 1918! Originally these goats were used as food for large cats being delivered to zoos. Today, Nigerian dwarf goats are known for their dairy production or as petting zoo and companionship animals. Nigerian dwarf goats are known for their small stature. Females, also known as does, are just 22.5 inches tall, while males, known as bucks, are 23.5 inches tall. That’s less than two feet! These goats have blue, brown or golden eyes. Their fur is black, cream, chocolate, gold, white or a mix. Whatever the fur color may be it can range from light to dark. The Milwaukee Zoo’s baby goats are a mix known as black Swiss marked, distinguished by a mostly black body with tan, brown or white legs, as well as hind quarters, ears and face. Nigerian dwarf goats are ruminants, which means they chew cud regurgitated from the first stomach. In total, goats have four stomachs, just like a cow! Each stomach, also known as a chamber, is designed to extract nutrients from the hay or grass they munch on. Once the food reaches the final stomach, known as the abomasum, it is processed the same as a single-stomached animal. Besides the hay and grass, Nigerian dwarf goats are fed loose mineral that contains calcium and phosphorous, which helps keeps their bones strong and make milk. Before heading to the yard, the goats are offered grain, (not the same product that is in the Zoo’s petting yard machines), as an extra supplement to their diets. On average, a doe Nigerian dwarf goat produces 2.5 pounds (half gallon) of milk each day! Nigerian dwarf goat milk is sweeter and richer than any other dairy goat breed. The milk is also creamier and easier for humans to digest compared to cow’s milk. Besides being used for drinking, Nigerian dwarf goat’s milk is used to make butter, cheese, ice cream, soap, lotion and so much more! Feeling adventurous? Visit the Milwaukee County Zoo September 8 and 9 from 10 a.m. to 2 p.m. for Family Farm Weekend sponsored by the Wisconsin Milk Marketing Board and visit the farmer’s market to try different products, such as soap, made by these hardworking goats! 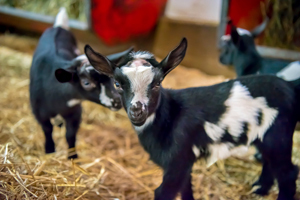 Visit the Goat Yard at Northwestern Mutual Family Farm to meet the Zoo’s resident Nigerian Dwarf Goats! Duchess, Princess Fiona and Beatrice won’t be in the Goat Yard until next season because they are so small. But, during your visit you can meet and feed any of our other goats, as well as two 1-year-old females, Beezus and Romona, from 10 a.m. to 4:30 p.m. daily. In fall, the goat yard is open every day in September and the first three weekends in October, unless it is raining. Pellets must be purchased for feedings.